Stay out of dinner ruts! Use our easy-peasy week-night dinners and watch'em gobble it up. 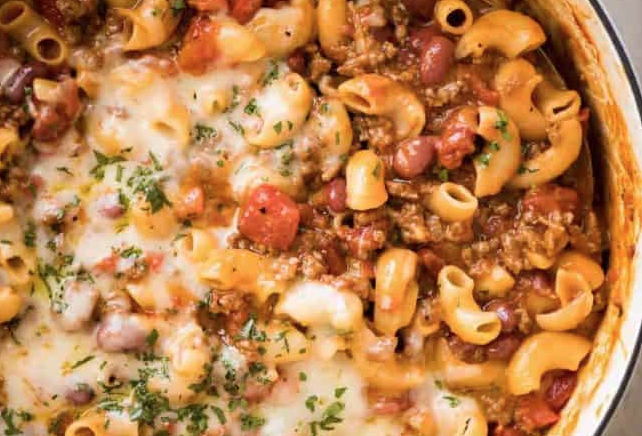 Don't be stumped for dinner ideas on busy school nights Give one of these great dinners a whirl! Heat oil in Dutch oven over medium heat. Add garlic and onions and saute for a minute then add ground beef and cook until browned. Drain fat. Stir in broth, tomatoes, beans, chili powder, cumin and salt & pepper. Bring to a boil then turn down to simmer. Add pasta and cook for 12 mins. Remove from heat, top with cheese and cover until melted. Serve! Heat oil in Dutch oven on medium heat. Add sausage and cook until browned, crumbling it. Drain fat. Stir in garlic, onion and Italian seasoning. Stir until onions are soft. Whisk in flour for one minute. Whist in broth and tomato sauce. Bring to boil then reduce and simmer for about 10 minutes. Stir in tortellini and cover, cooking for 5 minutes. Stir in kale, heavy cream and basil. Season with salt and pepper. Serve! Preheat oven to 400. Line a baking sheet with foil. Top tortillas with guacamole, cheese and corn and layer with another tortilla. Repeat until you have four. Put prepped quesadillas on baking sheet and put in oven until cheese has melted (approx. 10 mins.) Cut with pizza cutter & serve with sour cream, rice and beans. Preheat oven to 400. Season chops with salt and pepper. Melt butter in large skillet on medium heat. Add chops and sear until brown on both sides. Place on baking sheet lined with foil and put in oven to roast for about 10 minutes. While chops roast, make glaze by combining all ingredients and heating in small sauce pan. Simmer 5 minutes. Remove chops to a plate and cover with sauce. Serve with mashed potatoes and green beans.